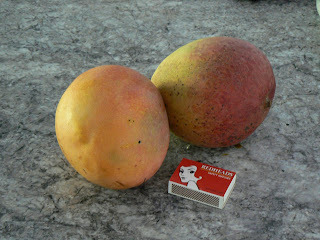 The first mangoes are ripening just in time for Christmas! I'm just about to cut these up for Christmas morning's breakfast fruit platters for our guests (the date here is now the 24th December - Aussie-time!). We have "full house" with lovely folk from Minnesota and others arriving this afternoon are from Canada. I don't think anyone is missing their weather at home! Ali and Zack have just left for a leisurely drive and walk through the rainforest with probably a dip in a fresh-water swimming-hole to cool off on this hot day. Peter and I would like to wish everyone a very happy festive season!